TVS Wego gets mild cosmetic updates along with a BSIV compliant engine. TVS Motors has launched the BSIV version of the Wego scooter at a price of Rs 50,434 (ex-showroom, Delhi). Along with that, TVS has also given the Wego some cosmetic updates including two new colour options. As you might already know, the government has made it mandatory for the all the new two-wheelers to meet BS-IV norms starting April 2017. As a result of this, most of the two-wheeler manufacturers have started rolling products, which now meet these norms. The Wego is TVS’ first product to meet the BS-IV norms. In the refreshed model, there are no mechanical changes. This means it continues to come powered by the same 109.7cc single-cylinder engine, producing 8bhp of peak power and 8Nm of torque. The engine is mated to a CVT auto gearbox. 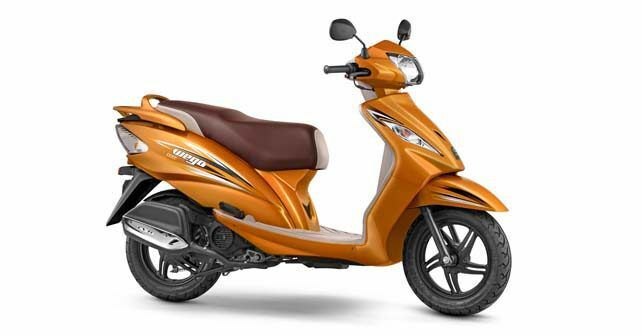 As for the cosmetic updates, the Wego now comes with two new colour options - Metallic Orange and T-Grey, along with silver oak panels and dual-tone seat colour. The scooter also gets a USB charging port now.